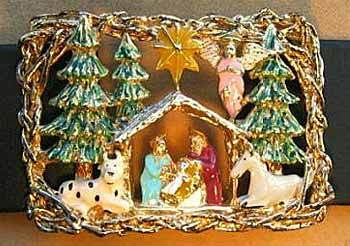 In the spirit of the holiday, here's a nativity belt buckle. Really, what can you say? Have a great Christmas, anyone who may be out there. 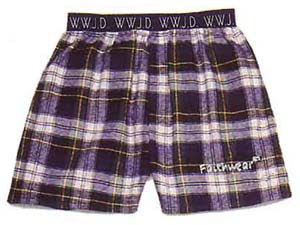 Jesus was a boxers man, I guess. Maybe underpants weren't the best choice? Kind of. Except he was born on Christmas (theoretically). 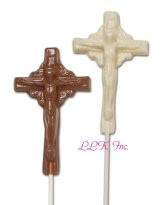 The nails and the cross came around Easter. I don't even know what I'm quibbling over THAT - I find these fit into the "downright offensive" category. Yeah, the guy had nails pounded through his wrists and ankles, attaching him to a wooden cross where he hung for days before finally dying. 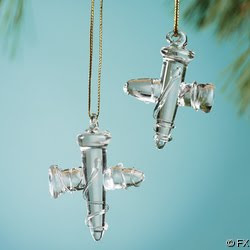 LET'S MAKE PRETTY TWINKLY NAILS OUT OF GLASS AND ARRANGE THEM TO BE A CROSS! WON'T THAT LOOK NICE NEXT TO OUR OTHER NOVELTY ORNAMENTS. Gaaaaah. Also, they look like penises. 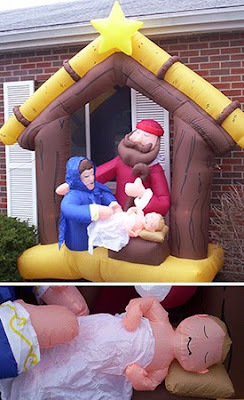 ...does that mean God is a bouncy castle? If it does, I have a lot of confessing to do. Sorry about all those times I jumped up and down on your face, Lord. I knew not what I did. ...I don't think this is what he had in mind. Let's start this blog off with something that just screams "class!" Yes, that is a giant honking dead Jesus belt buckle. In case subtlety isn't your thing. Before I get into things here, I'd like to clarify a few things. I do not have a problem with Jesus, or Christianity as a whole. I actually think Jesus was awesome, and "what would Jesus do?" seems like a good philosophy to me. I do, however, find some of the ways in which people attempt to capitalize on peoples' faith utterly bizarre, and often distasteful. I am aware of the great site "Jesus of the Week." I'm not trying to copy that site, nor do I intend on posting the things found there - I'm sure there will be some repeats, but I'm not going to that site for source material. Most of these are things I have found in stores myself, or else on stores' websites while shopping. Many of these items are from my own collection. Not everything here will be Jesus-themed, either - I've found some strange Mary merchandise, as well as things based on other Bible stories or Christianity in general. I'd also be delighted to showcase anything strange from any religion - if you've found a wacky Buddha or a seashell-encrusted pentacle, please show me! 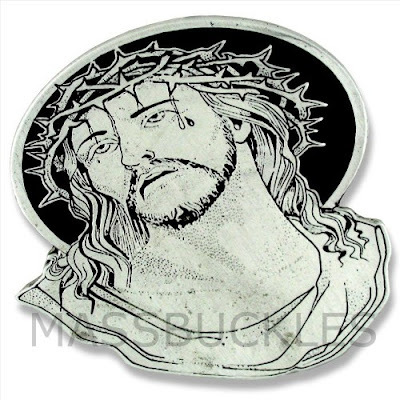 For that matter, if you've found a hilarious, tacky, hideous or adorable bit of Jesus merch, show me that, too! This website is merely to showcase my hobby and hopefully find other people who would like to participate; I'm not building said collection around the website. I claim no copyright to any of the items shown here, and most of the images aren't my property either. If you recognize your work and want it removed or wish to be credited, by all means contact me and I'll be glad to oblige.